For years, until I found it too painful to keep in my line of sight, I displayed a photograph of my two sons on our first day as a family. In it, they are seated at my dining room table, aged five and six, between them a large white cake with the words "Welcome Home" scrolled in blue icing. When, a few weeks later, the developed film came back to me, I winced at what I had captured: a pair of young boys, dull-haired and glassy-eyed like so many foster kids, miming happy smiles, attempting to please me—their new mom, their fourth each in the last five years—but clearly going through the motions. Still, the photo was an important symbol. I wanted us all to look at it years later and believe that it had been a good day, a day for celebration. I framed it and put it on the mantel. Half-brothers, my sons didn't resemble one another much, hadn't even lived in the same homes very often in their lives, but their social worker was convinced of the importance of them staying together. Being adopted by me—an adoptee myself—seemed to be their only shot at that. My younger son had been thriving in his foster family of two years, but his foster parents weren't interested in adopting his older brother. My older son was considered to be verging on "unadoptable" and was slated for a group home. And so, when I met them and wanted to foster-to-adopt them both, they were moved again. As the years went by and it became clear that they both had great difficulty forming emotional attachments (even with one another), as they acted out the pain of so many severed and strained relationships with previous caregivers, I wondered if the right decision had been made on their behalf. Was getting to grow up together worth the damage that had been caused by yet another disruption and displacement in their lives? 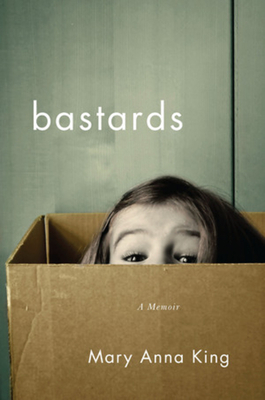 In Bastards, Mary Anna King tells her own story of sibling disruption and displacement. King, her parents' second child and first daughter, is the keeper of the family's troubled history. Her father, Michael, a dreamy drifter, comes and goes from the small family apartment. Her mother, Peggy, a former foster child who has a rocky relationship with her own father and stepmother, seems to be at the mercy of her young husband's wavering commitment. When King's parents' relationship begins to fall apart, her infant sister, Rebecca, is taken back to Oklahoma by their grandparents for medical care that the distracted young couple can't provide. Six months later, when Peggy becomes pregnant again and Michael says he doesn't want to raise the child, two-and-a-half-year-old King accompanies her parents to meet with the couple who will take her newest little sister to live with them when she is born. Though she doesn't quite understand the arrangement, King decides that "the adoptive parents' claim on my developing sister did not negate mine, she was not a kingdom or a territory or a thing with a deed; she was a person. This baby girl would be both my sister and these other people's daughter." Though King comes to terms with this second lost little sister, the scenario repeats itself three more times, with three more sisters being born and placed for adoption. Each time, the adoptive parents promise that their new daughter will be given information about her first family when she turns 18. To young King, watching her sisters be given away becomes, in some ways, routine, but also a sign that her family was less-than, unable to sustain these new siblings. With her father slipping in and out of the scene and her mother struggling to care for King and her brother, it was clear that "we didn't have enough room, enough clothes, enough food or laps to sit on or hands to hold." Then, in a moment of hopefulness, Michael and Peggy reconcile, move to a real house, and decide to make the family whole again by demanding that Peggy's parents return Rebecca to them. When the now six-year-old girl reappears, she is "as exotic as the snow leopard at the Philly Zoo: shiny, well fed, and obviously grown in different soil." She also shows the emotional wear of being forced to leave behind the only home and parents she has ever known and carve out a place for herself with her original family—virtual strangers who insist on a familiarity she doesn’t feel. Rebecca struggles with the change, and King labors with the disappointment that she and her sister are so different from one another. My sister hung by the sink while Granddad shaved every morning and sat on the side of his armchair while he checked our homework every night. Mimi reached for Rebecca's hand when we crossed parking lots and stroked her hair at the dinner table. They were vigilant about any slight change in Rebecca; a sniffle, a sneeze, a high color in her cheeks, and she was tucked on the couch for the day with her favorite movies and an assortment of treats to woo her appetite. Mimi bought special milk for Rebecca's sensitive stomach, cut her sandwiches into triangles instead of squares. They held the memory of the ailing baby they had saved; she would always be that for them. It is at this point in the narrative that the story rounds a corner of sorts. Oftentimes, memoir that relies on recreations of pivotal early events in the narrator's life can be difficult to buy in to, can feel too fictionalized for comfort. I reacted, as an example, to Jeanette Walls' The Glass Castle in this way, struggling to silence my inner skeptic as she vividly dramatized scenes from her early childhood. King builds trust with her reader by not fictionalizing scenes when she does not have memory of them. And so, the first section of the book relies less on King's childhood recollections and more on her translations of the family's collective memory, which she attaches seamlessly to visual snippets from her memory. The memoir builds deftly, however, from King's internal reactions once she moves to Oklahoma and is adopted by her grandparents. It is at this point that the book also officially becomes "an adoptee memoir." Here, it would have been easy for King to fall into the undercurrent of cliché that threatens to drag so many of our adoptee narratives down. Telling a true adoption story is a gargantuan task given the strong wave of societal archetypes that ensure that stories about adoption stick to a small array of sanctioned scripts, the most pervasive being the redemption narrative. Prescriptive instructions for redemption for adoptees permeate our culture's fairy tales, myths, and literature. Writers and artists use those instructions to develop characters in comic books, young adult literature, musicals, soap operas, and video games. (Not to mention what Disney's done with the orphan franchise.) At the basic level, adoption narratives are overrepresented in popular culture because rectifying abandonment and orphan status by adoption is an easy plot device to develop a story arc that moves from hardship to resolution. But that story arc is so pervasive that it has taken on power beyond the story: it has become the lens by which everyone sees adoption, even in "real life." That lens extends to adoptees ourselves, and even (perhaps especially) those of us who attempt our own honest narratives about our own adoptive experience. I know firsthand and from talking with other adoptee writers that going "off script" in telling one's story is a difficult task. Just as speaking out against institutionalized white supremacy can get a white person labeled a "race traitor," speaking out against the institutionalized norms of the adoption narrative can get an adoptee labeled as an "ungrateful adoptee." And given the legacy of abandonment, disruption, and displacement that most of us have in the first place, there is a compulsion to clean up the story and make it "right." The stakes—that by telling the truth we will lose whatever family connections we have left—are too high. King not only deviates from the powerful archetypes of adoption, she leverages them against themselves to unmask them for what they are—she calls attention to them. There's bravery in doing that, for sure—but this approach is also evidence of intellect. And, as she moves her story forward she shows an increasing amount of her growing self-analysis, developing herself as a believable character from toddlerhood to adulthood. Like most adoptees, high-school-aged King carries with her the weight of trauma from her early childhood and suffers from generalized anxiety and panic attacks that make it difficult for her to differentiate her actual feelings from what she thinks she should be feeling, yet college-aged King remarks on how she realizes she is posing herself deliberately as a successful young adult, driven by the thought of her four sisters' return and her desire to be "a person worth finding, worth keeping." Our reunions were a brush with another dimension; with the people we might have been. All people fantasize about mythical ways their lives could have been different; in their minds they finally walk down the road not taken and play out new chains of events. Part of growing up is realizing that it doesn't matter, in the end you would be same person, as likely to have ended up where you were regardless of what choice you made. But for an adopted person that sort of fantasizing is not ephemera. It is a complete alternate reality in which you have enough information to fill in the blanks. The cracks you would have fallen through, the place you might have slept, the woman who would have been your mother, the man who would have been your father. As King unfurls the story of each sister's life, of her older brother's life, and of the lives of her mother and father, her grandparents, and each set of adoptive parents, the negative impact of adoption can be measured for every involved individual. King writes her story with not only honesty and grace, but also compassion. Likewise, in attempting to disrupt the redemption narrative of adoption, many adoptees strike out against their adoptive parents, but King provides us with a more nuanced approach that allows us to consider the ramifications of family disruption more clearly. Though King extends this compassion also to her birthmother, Peggy, what was missing for me was more detail and exploration of Peggy's emotional terrain. This small gap in the story is, I suppose, the consequence of writing about one's life while so many of the people depicted are still alive—a challenge many memoirists face. Otherwise, the book moves steadily forward in a clear, well-paced manner and in a conversational yet colorful style rooted in the oral tradition of working-class women. King studied English literature at Colgate University and, though this is her first book, her mastery of plotting, suspense, and resolution are apparent. The book is also, surprisingly, hilarious in parts, providing a good deal of wit to offset what could have been an overabundance of grit. I read Bastards in a couple of intense gulps, gripped by the story and the narrative voice, the imprint of King's descriptions of apartment complexes populated by single moms and cluttered children's shared bedrooms so strong that I'm still thinking about them now, weeks later. Though, as an adopted daughter, I certainly identify with King's three youngest sisters, who grew up, as one of them remarked, with the sense that there was a "piece missing, like a hole inside that wasn't right," as an adoptive mother, the most profound scenes in this book are those that portray the displacement of the older siblings—when Rebecca returns to her parents' house in New Jersey and is forced to take part in a family life with which she is totally unfamiliar, and, later, when King and her brother move to Oklahoma to live with their grandparents and find themselves in unfamiliar territory with rules, expectations, and relationships they scramble desperately to navigate. I can't help but think of my boys all of those years ago, dull-eyed and exhausted, posing with their "Welcome Home" cake, their pretend smiles, and the toll that this last disruption took on them. For many adoptees and foster children, the what if, what if, what if of separation from our first families is a constant gnawing; for some it is a gaping, unstaunchable wound. Such absence and apartness is a difficult feeling to convey, but Mary Anna King pulls it to the page with Bastards, a book that is sure to be anthem-like for adoptee readers, should be required reading for adoptive parents, and is, beyond that, a vivid, absorbing story that is sure to sate fans of literary memoir.